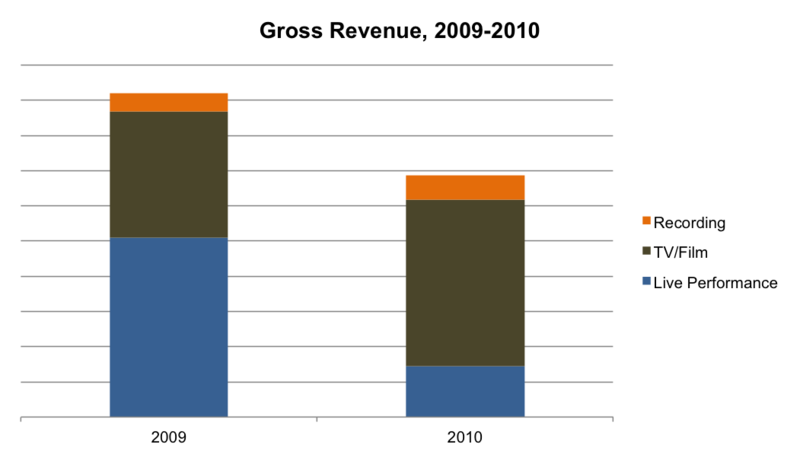 This section reviews the overall gross income numbers for 2009-2010 for the Background Vocalist, as well as definitions for each category. In 2009-2010, the Background Vocalist makes 52% of her income from TV and film work – both from appearance fees as a background/session vocalist on a popular TV network talent show where she is a salaried performer and from “TV/film mailbox money” from previous TV and film appearances as a background/session vocalist. Performing as a background vocalist in live performances on tour, primarily with one artist, makes up 41% of her income in 2009-2010. The remaining 7& comes from work as a background/session musician in the recording studio, and consists of both direct session payments for her time spent in the recording studio and regular (annual) income streams from “recording mailbox money” from the AFM & SAG-AFTRA Fund for her work as a background/session musician. All payments for the Background Vocalist’s television and film appearances are governed by the union scale, which is a standardized rate negotiated by SAG-AFTRA (AFL-CIO) – the union that represents vocalists who perform on television, film and radio. (Instrumentalists are represented by AFM, the American Federation of Musicians.) These rates for film and television session work are usually renegotiated every three years between the unions (SAG-AFTRA and AFM) and the employers (record companies, TV and film producers, commercial producers, network TV, etc). Musician appearances on television can range from being in a house band for a live show (as on many late night shows), to appearing on a scripted television show with musical numbers (ex. Glee), appearing as a special guest on a program like a talk show, or appearing on a musical contest show. These are only a few examples. Musician appearances on film can range from on-camera acting or singing to off-camera singing (i.e. an animated musical feature film of the kind that Disney often makes) to using previously recorded tracks (if these tracks were originally recorded under a union contract). There are set rates for each kind of appearance. For more specifics on how much artists who are covered by SAG-AFTRA get paid for various television and recording appearances, refer to: http://www.sagaftra.org/production-center. In this report, we refer to two different categories of payment for television and film work. When the artist goes into the television or film studio and performs, we call it a TV/Film Appearance. If the television show or film does well, the artist shares in the success of the show and will continue to get royalty checks or residual payments (which we call TV/Film Mailbox Money) when the show is rebroadcast, when there are new uses (e.g. DVD, iTunes), and when the artist is entitled to a portion of royalties (e.g. foreign use) from various uses of the show. We use the phrase “mailbox money” here because artists sometimes refer to this second category of payments that way. Some of these additional payments are explained in Appendix A which is an overview of how SAG-AFTRA calculates mailbox money in different media.